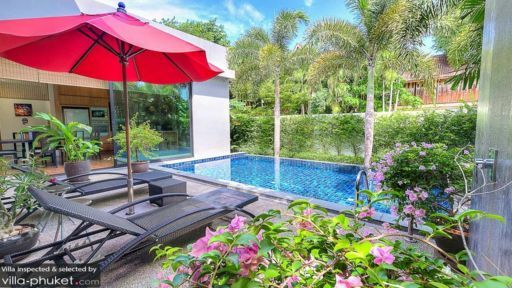 Villa Lora is a stunning three bedroom garden haven located in the district of Nai Harn on the island of Phuket, Thailand. Guests can enjoy staying in a beautiful green setting here at the villa with its lush garden that surrounds the villa. This serves as a relaxing view from almost every space in the villa. 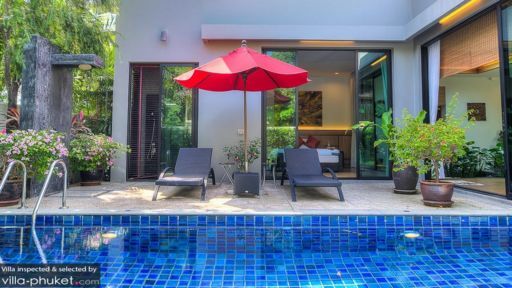 With impeccable living spaces, friendly staff, and proximity to one of Phuket’s top spots, you are sure to have a memorable experience here at Villa Lora. There are three modern and stylish bedrooms here at Villa Lora. Each is equipped with a comfortable king size bed that will help you get a full and luxurious rest. With wooden floorings and floor to ceiling windows that reveal the lush garden, you are sure to be relaxed and rejuvenated. The rooms also come with a comfortable chair and coffee table where you can enjoy the view while sipping your morning coffee. Each bedroom also comes with a gorgeous en suite bathroom that blends natural elements to fit the garden view from outside the windows. These design elements make for a truly invigorating bathing experience. Villa Lora has a quaint and relaxing outdoor space that is sure to revive your spirits. The blue outdoor pool is surrounded by a number of plants and trees, adding to the relaxing atmosphere. Under the shade of a large umbrella are two sun loungers where you can read a good book or soak up some sun. There is also an outdoor shower if you want to rinse off after a good afternoon swim. The villa itself is surrounded by a number of plants, which is a view you can enjoy almost everywhere--from the bedrooms to the living area. Villa Lora’s living area is a perfect complement to the relaxed and rejuvenating atmosphere of the villa’s outdoor space. Designed in an open plan living space, the kitchen, dining, and lounge areas flow seamlessly into one another. There is a skylight in the corner and a stone pocket garden that joins the dining and kitchen area to the lounge area. The space is designed with a number of natural elements such as wood and stone that adds to the atmosphere. There rest of the space has a fully equipped kitchen and six seater dining area for you to enjoy your meals in. This leads out onto the pool and garden area. The lounge space has a comfortable L shaped sofa on which you can sit back and watch TV or a movie with your loved ones. The staff here at Villa Lora are friendly and hospitable, always striving to make your holiday pleasant and relaxing. The villa comes with a concierge, housekeeping, and a security service to ensure that you’ll have a safe and comfortable stay. Here you will be treated with care and introduced to Thai hospitality. 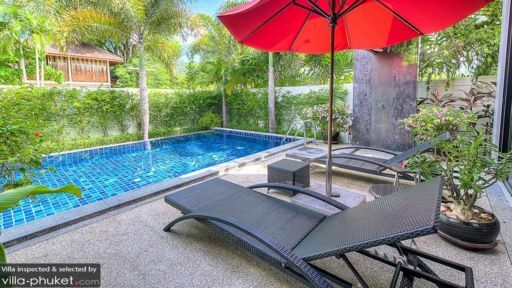 Villa Lora is located in Nai Harn, which offers various activities for guests to enjoy. Near the villa are a number of cafés, restaurants, and shops. Nai Harn Beach, which is quite popular amongst tourists and locals while maintaining a relaxed beach vibe, is close from the villa. Near Nai Harn Beach are a number of restaurants and hotels that serve a variety of cuisines. If you ever want to visit other areas, Ya Nui and Ao Sane are a short drive away and are good locations for those who want to snorkel or dive.